The University of Utah, Neuropsychiatric Institute is located on the east side of the U of U campus. The building’s design consists of a four-story 115,000 square-foot health care facility for the medical research and treatment of patients. 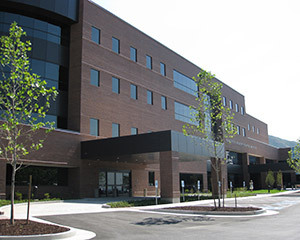 The project also includes a two-story bridge that connects the new facility to the existing Neuropsychiatric Institute. The building consists of 170 patient rooms, food service, main entry lobby, service desk, registration area, wellness center, conference rooms, meditation room, nurse’s stations and offices. There are three high-efficiency condensing boilers, three water-cooled chillers, and an indirect evaporative cooling system providing heating and chilled water to the building. E Cube provided both Fundamental and Enhanced LEED HVAC commissioning. The HVAC equipment for the hospital kitchen, which provides approximately 1,000 meals per day to both the patients and staff, includes approximately 20,000 CFM for exhaust hood systems. These hoods have optical sensors that measure the heat and smoke rising from the cooking equipment and vary the exhaust from the hood to maintain adequate hood ventilation while conserving energy. The make-up air system is also interfaced with the hood system and varies the make-up air CFM to match the output of the hoods. There are also standard systems serving the kitchen and dining areas, such as AHUs and VAV boxes. These systems operate in a fairly typical fashion, except the kitchen AHU also has a kitchen pressurization sequence to ensure the kitchen is always slightly negative to the dining room and the rest of the hospital. Systems commissioned included: Mechanical (HVAC), Electrical, HVAC controls, Plumbing (Vacuum and Compressed Air), Pure Water System, Energy Recovery Systems, Lighting Controls and Emergency Power Backup Systems, BSL-3 Labs, and Medical Gas Systems.